Since March, I've been busy house shopping, packing, moving, and unpacking. It's been exhausting, but seeing my new office come together makes it all worthwhile. 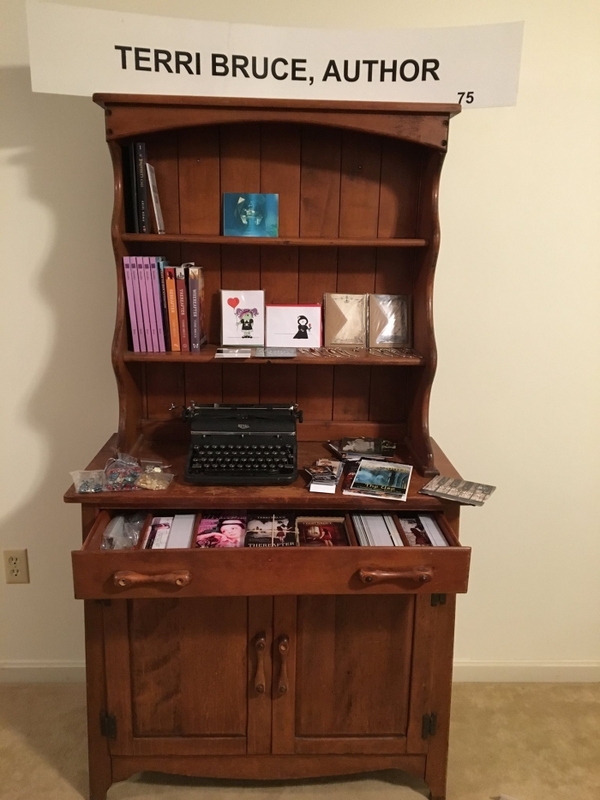 I now have a dedicated space for all of my swag and giveaway prizes (pictured above). And an especially good omen, I found an old manual typewriter at an antique shop recently - I've wanted one of these for a long time (no author's office should be without one!). I learned to type on a manual typewriter; when my mother let me have her (1970's style) electric typewriter, I thought it was the height of luxury - how easily the keys pressed (but with a gunshot report and a bit of press back against the fingers) and that wonderful bell that dinged at the end of every line. How I miss the days of the electric typewriter (though I wouldn't give up my delete key and copy/cut and paste for anything!). I love that scene in "You've Got Mail" where Greg Kinnear's character lovingly talks about his latest typewriter. 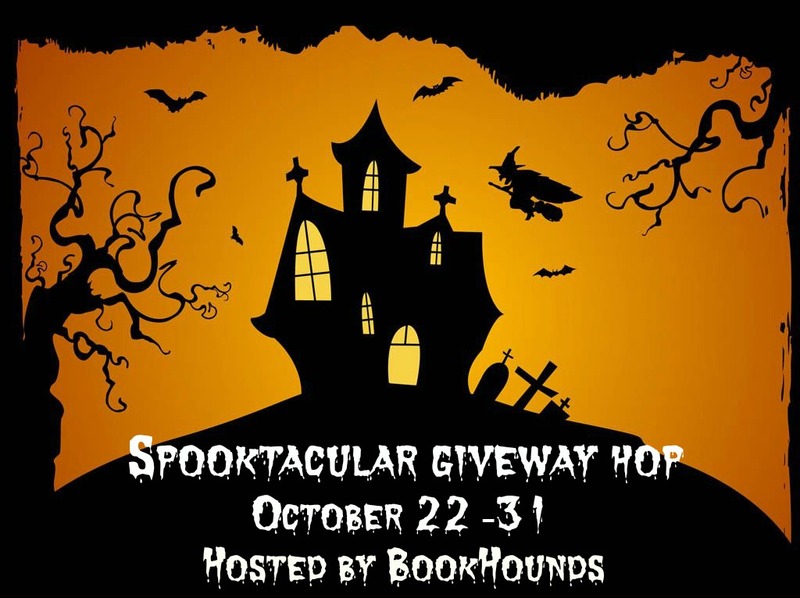 Now through Halloween, I'm taking part in the Spooktacular Blog Hop, along with over 100 other blogs each giving away a prize worth at least $10. For my giveaway we're talking about our favorite Halloween movies, and I'm giving away an adorable decorative Halloween cat ornament, a signed paperback copy of Hereafter, and an Afterlife Series swag pack. Stop by my blog to check it out (and be sure to visit as many of the other participating blogs as you can). At some point while I was moving, Hereafter reached 50 reviews on Amazon (woohoo!!! ::throws confetti::). Thank you all so much for helping me reach this important milestone. I'm still working on contacting the winners of the two $50 Amazon Gift Cards; as soon as I am able to reach them both, the winners will be announced. If you haven’t yet read Thereafter and would like to, let me know, and I’ll send you an ebook review copy (epub or mobi) as a special thanks to you as a newsletter subscriber. The catch is that you have to leave a review on Amazon, though! For anyone who is interested, I can send you a stack of Thereafter postcards and/or bookmarks to give out (to friends, acquaintances, your book club, your local library and bookstore, etc.). Just email me back with your mailing address and I’ll send that out to you. And, of course, I’m also working on having Whereafter (Afterlife #3) hit 10 reviews on Amazon, so please be sure you’ve left a review of Whereafter on Amazon, too!